The Thorp House Inn, built around the turn-of-the century in the early 1900’s and on the National Register of Historic Places, is a magnificent example of Victorian warmth, charm and style! DoorCountyNavigator.com Recommended! Tremendous history and elegance. LaVyrle Spencer, author of “Bittersweet,” stayed here! 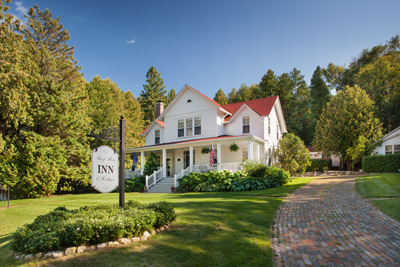 DoorCountyNavigator.com loves this inn - charming and outstanding! Please be certain to tell them that DoorCountyNavigator sent you! 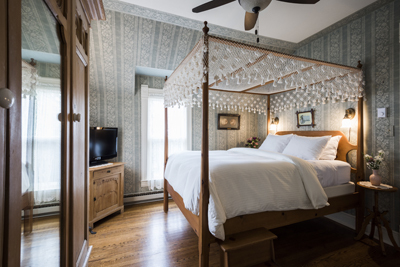 The innkeeper and owner, Melanie, purchased the inn in 2011, and has done a superb job running the inn just like it has been run for the for the last 23+years. We recently revisited the inn, met with Melanie and took another tour. The inn is more magnificent as ever! See its glory in the video below - just awesome! When you walk in, you know you are going to like it, as you enter the sitting room, small and cozy, with fireplace, comfortable period pieces and wall décor. Off to the right is a small library, with two period loveseats, and a whole wall of books – select one and have a seat and relax with a cup of tea! One shelf is loaded with the romance novels of LaVyrle Spencer, a very popular author who stays at the inn each year! In fact, Thorp House inspired her best selling novel, "Bittersweet!" The kitchen on the first floor looks like a snapshot from a magazine – it is so beautiful, you want to sit down at the long wooden table and have a cup of coffee and a nice breakfast! to Everil (shown below), done in the neo-classical style, the rooms are meticulously appointed and show the talent for maintaining an authentic, 100+ year old, home feel. Some of the rooms even have original photos of some of thee inns original dwellers! Some very nice touches like this bring alive the history of the home! The Everil Room is the largest, and has a double whirlpool, private balcony, and gas fireplace – the stuff honeymoons are made of! The Jessie (shown below) is another spcutacular room with a queen sized bed, with carved walnut frame with an 8 foot high headboard. Breathtaking! 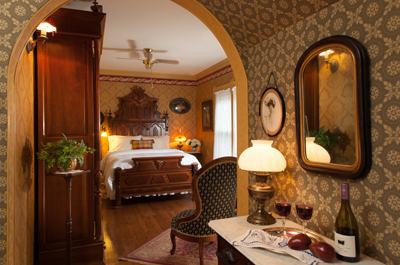 In each room, the treatment is exquisite, with period wallpapers, antiques and furnishings, and, aside from electric lights, you would swear it was still the turn of the century! Ranges: depending on the accommodation, and season; you should always check with the innkeeper for current rates and availability. Adults only in the main house. Kids in the cottages only. -Home baked breakfast served in "turn-of-the-century" kitchen and front library. -Each of the 5 rooms, painstakingly researched and exquisitely decorated in authentic antiques and true-to-period wall covering, lighting and European lace. -Main floor library/sitting room authentically appointed. The Thorp House Inn was both a surprise and a delight – a surprise because you have to try to find the place, on a small back street in Fish Creek; a delight in everything we saw! Our tour was utterly captivating from start to finish. 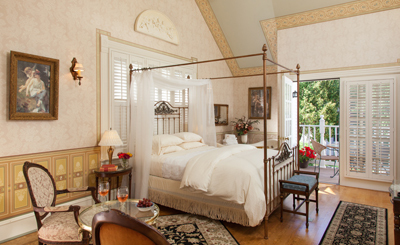 Each room was infused with individual personality by the owners obvious sense of historic elegance. The staff has always been warm and helpful on our many stops here! The Everil Room, the crown of Thorp House, must be experienced to be appreciated, as must the overall feel of Thorp House and what must be their unforgettable breakfasts in the kitchen—a room that inexorably drew us back to a time we have only read about, exuding warmth, and style. And they are open in winter for your romntic and cozy winter getaways! The Thorp House is a must for all romantics, whether you admit it or not! We highly recommend it! Please refer to Property ID # DCNAV-4135 and you must tell them that DoorCountyNavigator.com sent you!